Much of the Pittsburgh Steelers’ defensive successes on Thursday were overshadowed by an offensive explosion led by quarterback Ben Roethlisberger. The 52-21 drubbing over the Carolina Panthers featured the likes of Antonio Brown, JuJu Smith-Schuster, James Conner and Vance McDonald — but two stalwarts on the defensive line, Cameron Heyward and Stephon Tuitt, were equally as impressive and have been for years. Against the Panthers, Tuitt and Heyward combined for eight pressures, adding to what has been a quarterback’s nightmare for the last few seasons. The two have combined for more than 100 pressures in two of the past three years — Aaron Donald and Michael Brockers of the Los Angeles Rams are the only other interior defensive lineman duo to do the same, and that’s not bad company to be in. Over their past three games this season, Tuitt’s and Heyward’s 23 combined pressures have equaled Donald’s and Brocker’s 23 over their past three games. That comparison says all that needs to be said about the Steelers duo’s dominance in attacking the quarterback. And while the duo hasn’t particularly stood out in run defense in the past, Tuitt currently holds an above-average run defense grade of 74.6. Heyward’s 83.9 run defense grade a year ago was a career-best, so the two have shown the capability to dominate in both major facets of playing on the defensive line. The Steelers have a team pressure rate of 41.1%, which ranks ninth in the league and can be heavily attributed to Heyward and Tuitt, who rank first and tied for second, respectively, on their team in pressures. 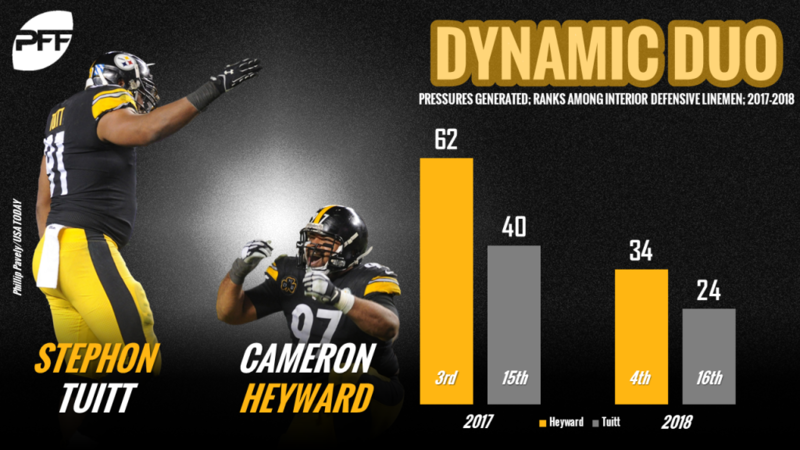 A deeper look into Heyward’s and Tuitt’s effect on opposing quarterbacks reveals a duo that excels at making quarterbacks uncomfortable. The Steelers lead the NFL in opposing quarterback’s time to throw on plays with pressure. Those quarterbacks are averaging just 2.96 seconds before throwing, the least amount of time allowed by a defense when it generates pressure. On Thursday, that pressure proved to disrupt any chance of a comeback from Panthers quarterback Cam Newton. Newton did complete five of nine passes under pressure, but they combined for just 44 yards, and his average depth of throw on those attempts was a measly 4.7 yards. Anytime the Steelers can put up 52 points, the story will be about the offense. But amid the team’s frequent offensive outbursts, Heyward and Tuitt, while both recognized as stellar players individually, have developed into one of the NFL’s best pass-rushing duos. Their combined 58 pressures in 2018 are 40.2% of the Steelers’ total pressures (and is eight more than the total number of pressures generated by the Oakland Raiders’ entire defense). And on Thursday, the two displayed their skill once again as the Steelers continue to prove they’ll be a threat in the AFC come playoff time.